Unlock Samsung I8190 Galaxy S3 Mini - Safe IMEI Unlocking Codes for You! Unlock Samsung I8190 Galaxy S3 Mini Handset! In case your I8190 Galaxy S3 Mini doesn't ask for the code and there is no designated field to enter it, please DON'T PLACE ANY ORDER, contact us first for support. Get unlocked your Samsung I8190 Galaxy S3 Minie and use it with Any GSM SIM Card worldwide! The codes works for the latest models including Samsung Galaxy S, Galaxy II, Galaxy III, Galaxy Note, Infuse 4G, Omnia, Galaxy Skyrocket, Captivate and many more! How to Unlock Samsung I8190 Galaxy S3 Mini Phone - Tutorial! 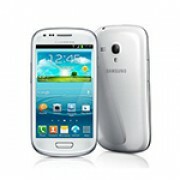 Please find bellow a step-by-step guide to follow in order to unlock your Samsung Galaxy S3 Mini I8190 . pls help me unlock my handset from Belgium Mobistar. Not 100% sure if my phone's country of origin. Seemed to gave deleted email. Will IMEI alone unlock phone? Can you give refunds in case I got a problem with the codes? Well I tried to enter the imei information 3 times all correct #'s and says it is "IMEI not valid" I have a Samsung SIII mini AT&T model. Thanks for help if able to. Hi Patric, please email us your IMEI no at support @ safeunlockcode.com Thanks! I need an unlock code for my Galaxy S3 mini, Mobilkom Austria, are the codes available? Hi Dean, the codes are available for your network. Just please fill in the form to check the price and the time needed. Thanks!